A good few months ago I was contacted by Willvin of Sweden about the opportunity to review one of their changing bags. 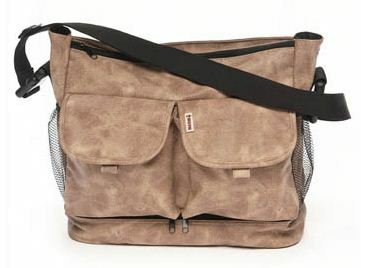 As you know I have a changing bag obsession and will grab any chance to get my hands on a new bag. I scoured their site but couldn’t decide which bag I wanted. I’d been on the site before and was spoilt for choice then so I did something I don’t usually do when buying a bag - I consulted Chris. I knew that he’d love the fact that Willvin make bags that men can carry too - no zebra print or hearts here – just great looking, quality changing bags. Eventually, we settled on the Willvin Leatherette in beige and I couldn't wait for it to arrive. As soon as I opened the packaging I fell in love with it and couldn't wait to test drive it. The Leatherette has plenty of space. The main 'bag' has 2 zipped compartments (which I can confirm can be opened with one hand). It has two front velco fastening pockets and a further compartment underneath as well as 2 side netted paockets and a back easy access pocket. The most important thing for me is that everthing in the bag is easily accessible, nappies and wipes need to be easy to grab when there's an 'uh-oh poo' moment, and there can't be too many pockets that you get confused in a rush. I only want to take one bag out with me - I don't want to have to take a handbag too to carry my things. The Leatherette is perfect for me as I keep my purse, my keys and all MY things in the front section of the main bag, nappies and wipes are in the other half along with a change of clothes. Bottles or cups fit easily in the side netted pockets and my mobile goes in the front pocket. The underneath part of the bag stays empty other than a carrier bag for those moments when there's an accident and a complete change of clothes is required (this is a regular occurance for me!) and I just put the 'wet' clothes in to the carrier and zip 'em underneath. I'm currently using the Quinny Zapp Xtra to whisk Little E around and I've talked before about the struggles to find a bag that works well with it. The Leatherette is perfect- it has a carry strap (as you would expect) but this unclips to make way for the intelligent stroller clips. You just clip the bag directly to your pram or pushchair which is great - I hate a bag that just hangs and slips down the handles. Those intelligent stroller clips I mentioned are also perfect when you're out shopping. I just clip the bag directly to the trolley rather than carrying it around on my shoulder like my old bag. I’ve got tons of changing bags and I used to swap and change between them quite a bit. 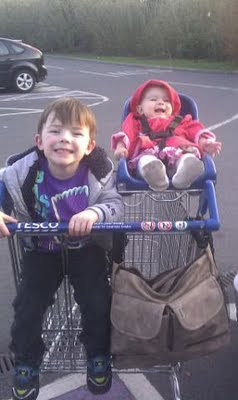 For the past few months though my Willvin has always been on my arm/pram/pushchair/shopping trolley, I love it we love it. In fact I love it so much that I even take it out with me when I'm on my own! Remember when I went for my Lee Stafford makeover?- I took that bag down to the big smoke for my trip and even the magazine girls loved it! Not only that it comes with lots of extra stuff too, like a changing mat so check out 'The Science Bit' below to find out about those. All in all, a perfect bag; fashionable, sturdy, great quality, wipe clean and plenty of room to carry anything you might need. Go get one - I can't live without mine! • Practical zip bag for ointments, medications or cotton buds. Find out more over at Willvin's main site.